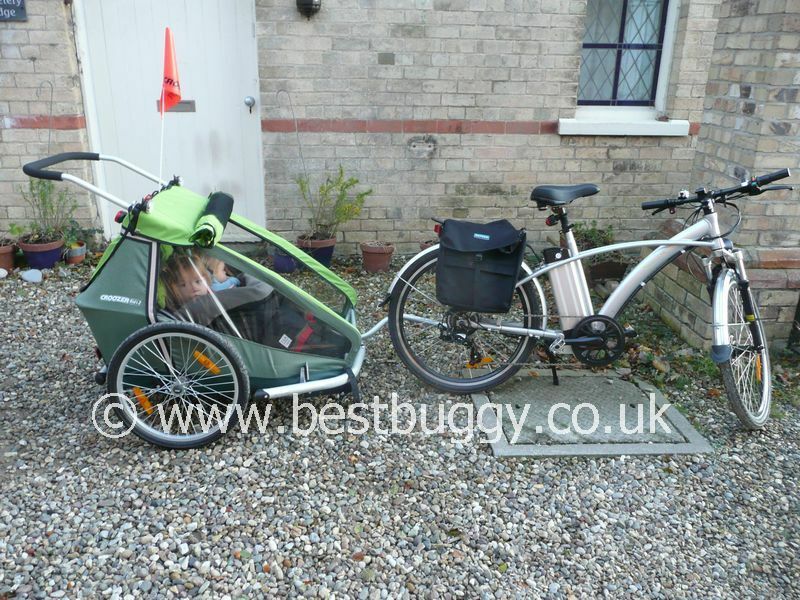 These photos show the Croozer Kid for 2 which is a bike trailer / double pushchair / twin running stroller all in one! There is a choice of a bike hitch arm, a single fixed jogging wheel or a small single swivel wheel for the front depending on the use you require the Croozer for. There are two large 20″ rear air tyres. We used the Croozer Kid for 2 mainly as a bike trailer. We lived literally on a major cycling path so sometimes we went out as a family to the beach. 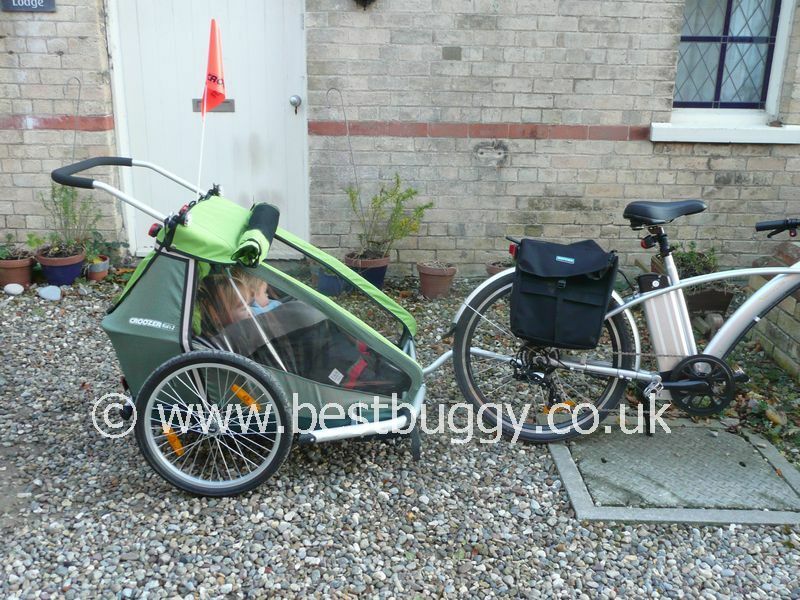 Sometimes I took the trailer on my own on the back of my bike (a standard bike) but the trailer was also used as a method to get our eldest to nursery – an approx 8 mile round trip on the back of Mr BB’s electric Juicy Bike. Mr BB loved racing the owls along the road first thing in a morning!! Our daughter used to wear her helmet when on the nursery run (on some minor roads) but we didn’t always use helmets when on the bike trail. The Croozer has two seats although it made no difference to the stability if only one seat was used. We chose the Croozer partly for the cut outs for the helmets but in reality the children were sat too low in the seats for these to be useful. We also liked that the seat could recline, but again because it was the whole seat that reclined, it was not really useful to us with children of different ages. As the photos show we did use a Chariot Baby support in the seat for our youngest. In some ways it wasn’t the best fit – his head did slip out of it at times, but it was better than nothing and the photos show that he did sleep comfortably with it. I did have to keep checking on him though. The harnesses were excellent – they held both children well. We found it easiest to undo one side rather than from the top to put them on. The children always seemed happy in the seats. Our eldest had plenty of room for her legs and the youngest could reach the floor. We used our 7AM Enfant Duo blanket on cooler days which fitted great! We worried about there only being mesh behind our daughter’s back for the long nursery run but she was always happy with her blanket and also some warm wheat bags when it was really cold! We liked the side pockets for bits and pieces – our daughter used to fill them with books to read on the journey to nursery. The rear storage compartment was huge and I often used to fill it with toys to play with on the beach. We even once filled it with helium balloons. There is a useful pocket which made finding my purse and keys easier! We added the lights onto loops on the rear of the pushchair, and more lights on the front, and always used the flag on top. The bright green made the Croozer fairly easy to spot. In bike mode, we found the Croozer easy to tow – even for me and I am not fit!! But I could pull it up and down hills and get us to the beach and back! The Croozer wasn’t good to push in pushchair mode, and I wouldn’t really recommend it for this use. In theory it is possible to bike to the shops, swap to the front swivel wheel to go around the shops, and then swap back again to bike home. However in practice this does not work as the Croozer needs lifting too high in the air to remove the bike hitch arm, and to do this, really both children needs taking out. It was easier to put a tiny pushchair in the rear compartment! The Croozer folds really easily into a fairly flat but large package for storage although in reality we just left it open all the time. The handle needs to be left on as a roll bar. We loved all the protective bars around the Croozer. The safety aspects were very important when we were deciding which bike trailer to buy. There are two covers on the Croozer – a mesh insect net one which was fab for air flow in summer, and a plastic one for cooler days. They simply velcro down at the front, or roll up at the top. We also bought the raincover but it is a little on the useless side because it only reinforces the plastic cover on the front. The trailer really needs an all over raincover! The sun cover was useful because we often rode when it was sunny and the sun got in the children’s eyes. Plus when our youngest was sleeping it gave him some cover as there are windows on three sides. All round we loved our Croozer Kid for 2 and it got us all out cycling as a family which was fab!